How and why we fall in love? How we develop from babies to adolescents to adults, and how during this development we so often become “stuck” in childlike behaviour, and how all these things are influenced by previous generations in our families.This knowing of how families behave and function, what makes some work and others fail, and how families can move up the scale towards greater health and happiness is helpful towards making life more understandable, meaningful, and enjoyable.Psychodrama is essentially a group action method. This could be used in any business establishment in team building, conflict management, stress management, identifying and working with stress, improving communication, building trust, identifying issues etc. 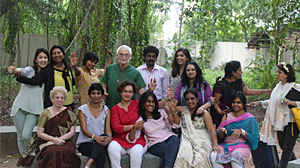 This method is a spontaneous and creative method which is used by well trained and certified psychodramtists who are usually called the Psychodrama director. A director enables or facilitates a re enactment of real life situations, past incidents or situations or an inner mental process but acting them out in the present time. If you are working as a trainer, therapist, team leader, life coach or mentor, if you like a safe space to process your own “stuff”. This is the workshop for you. Those looking to do group therapy sessions for personal growth. 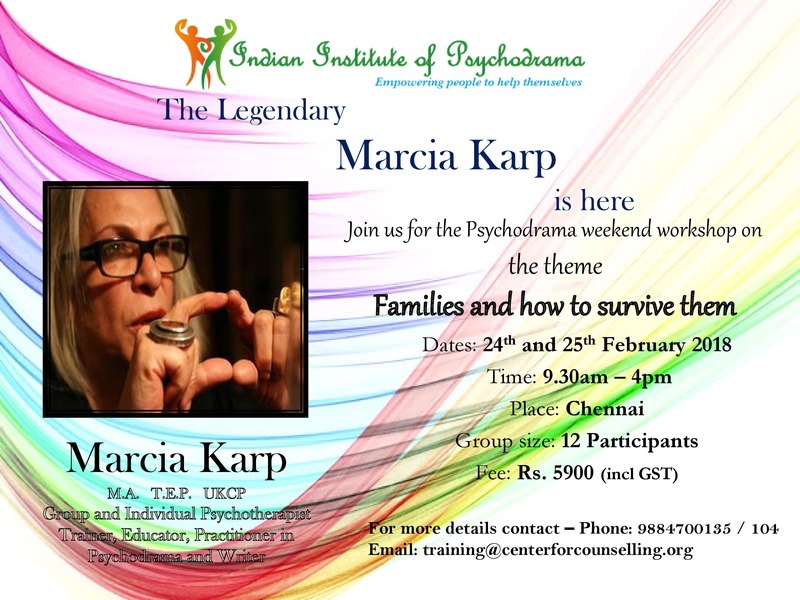 Those who are curious about the psychodrama method can also attend. 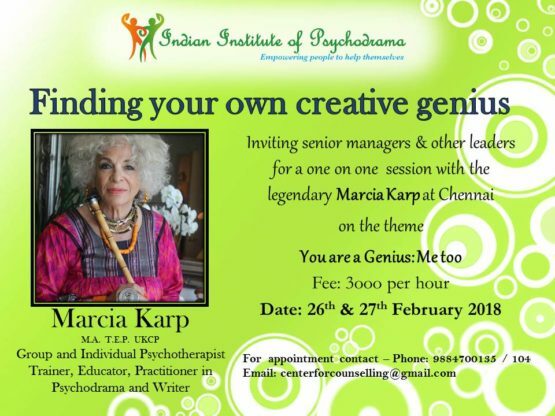 Ms.Marcia Karp, has worked as a psychotherapist for 50 years, including work in the NHS. She is a member of the United Kingdom Council for Psychotherapy (UKCP), International trainer in group psychotherapy. Founding member of Federation of European Psychodrama Training Organisations, Past Honorary President of British Psychodrama Association, past Board member of International Association of Group Psychotherapy, Lifetime Achievement Awards BPA(U.K.) and American Association of Psychodrama and Group Psychotherapy. Her training was at the Moreno Academy in New York, Certificate in Clinical Competence in Psychodrama, a Masters degree at Columbia University NYC and Training in Psychotherapy in GP practice at Bristol University.She have co-edited three books on psychodrama and contributed numerous chapters and articles on the subject. Film, TV and videos of her work are available. Therapy is a way to share your problems, and by so doing begin to find creative solutions, by talking it through, by action, by identifying with others, or by just stating the issues. For some people, the latter begins a whole new process of hope that something new may shift in their life. The physical and psychological inertia ceases and the work begins. For others, a commitment to try something new in action, a new way of relating to an old situation, or an adequate way of relating to a new situation, may help the individual spontaneously create their own answers. Finding the autonomous healing place of each person seeking help is an important focus of the work. The therapist is a mid-wife to that process.